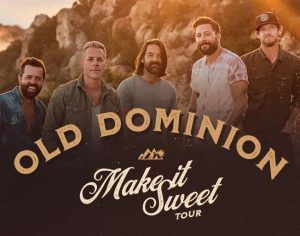 If any band can perpetually find the bright side, it’s Old Dominion. They do just that with their new live-for-the-moment anthem “Make It Sweet,” which is also the name of an accompanying tour set to begin in January 2019. The ACM Vocal Group of the Year-winning act’s first new music since their second LP Happy Endings was released in 2017, “Make It Sweet” is upbeat and to the point, an infectious lemonade-from-lemons mantra that insists, “Life is short, make it sweet.” The new single comes with a music video featuring a series of young couples living it up against the backdrop of some truly majestic natural landscapes, all of which culminates with a mountainside house party that syncs up with the song’s guitar solo.